The aftermath of the Life At Ten debacle during the Breeders’ Cup World Championships Nov. 5 stretches into week 15 without resolution. While it is certainly admirable the Kentucky Horse Racing Commission is leaving no stone unturned (89 interviews conducted), the longer this travesty goes without answers or action, the worse it looks for all involved—Kentucky, the Breeders’ Cup, and the National Thoroughbred Racing Association. In summary, Life At Ten was the 7-2 second-choice in the Breeders’ Cup Ladies’ Classic (gr. I). While in the saddling paddock, it became apparent to trainer Todd Pletcher and others in the vicinity that the multiple grade I winner was not herself. She was described as sluggish. In the past the mare had been a little slow to warm up, so Pletcher sent jockey John Velazquez out to the track to see if she would show more energy. During a pre-race interview on ESPN with analyst and former jockey Jerry Bailey, Velazquez told a national audience the mare was not right. Velazquez apparently said nothing to the veterinarians stationed around the track and the starting gate. A television producer, however, did alert the stewards to what Velazquez told Bailey. Still, Life At Ten was loaded into the gate, started without any sense of urgency or energy, and was not persevered with for the remainder of the Ladies’ Classic. After the race Pletcher suggested she may have had an adverse reaction to Salix, an anti-bleeder medication. No blood or urine samples were taken after the race because the testing barn was full and it would have been unsafe to put her in the already crowded barn, according to chief steward John Veitch. One misstep after the other. Another disturbing layer added to this mess is that Churchill Downs, host of the 2010 Breeders’ Cup, is accredited through the NTRA’s Safety and Integrity Alliance. The purpose of the alliance is to establish standards and practices that promote the safety and integrity of Thoroughbred racing. These standards include injury reporting and prevention through programs such as pre-race veterinary inspections, medication and testing, jockey safety and health standards, aftercare for retired racehorses, and wagering security. These are admirable programs, and we must strive to implement uniform standards at all racetracks. But how does the Life At Ten episode reflect on the effectiveness of this program? Churchill Downs spent tens of thousands of dollars on the accreditation process, made changes and upgrades, and went through an inspection of all its facilities and processes. And still, a horse unfit to race was allowed to start on racing’s championship day. “It is very troubling, but we think the situation underscores the need for the alliance,” said NTRA president Alex Waldrop. Interest in the voluntary accreditation has been sluggish. Only 19 of about 65 racetracks have signed on in two years—14 in 2009 and five in 2010. The alliance’s independent monitor, former Wisconsin governor Tommy Thompson, recently reiterated his disappointment and even suggested the American Graded Stakes Committee, which is run by the Thoroughbred Owners and Breeders Association, consider withholding graded status from races run at unaccredited tracks. That’s an interesting and probably ineffective bit of coercion, even if the AGSC agreed to it. And its members didn’t. Does anyone in the industry have the stomach or the legal authority to take the graded stakes away from Oaklawn or Gulfstream Park, which are not accredited? 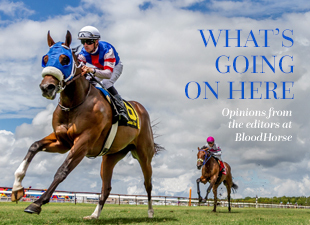 Are we willing to let our historically premier races go ungraded or moved to another track? Or, what if it is revealed in the Life At Ten mess that Churchill Downs violated some condition of its accreditation? Would the Kentucky Derby Presented by Yum! Brands or Kentucky Oaks (both gr. I) lose their graded status? We all know the answer is no. The NTRA admits it needs to do a better job selling the alliance to the public, but more importantly it first needs to sell the alliance to the industry. The first step might be to show the racetracks accreditation means something and has direct benefits—that adopting uniform standards on safety and integrity could help restore confidence in Thoroughbred racing. More confidence means more owner participation, higher handle from gamblers, and higher TV ratings (when races are on TV, but that’s another column) from fans. Life At Ten put us at this crossroads. The end result of the investigation must be meaningful and substantive, or the integrity of the alliance could be lost.